Great locationsubmitted by Karol C. - Oct 29, 2011 |Recommended: Yesits nice, only issue is no in unit laundry. response from property - Feb 02, 2012 We will be remodeling the laundry room this year and while we can not add in unit we have some great plans to make the laundry room very modern and a pleasant place to get the "task done". Average apartment with an above average rent pricesubmitted by Jose P. - Oct 01, 2011 |Recommended: YesGreat location and great staff. Building and apartments are dated and in need of renovation. response from property - Aug 13, 2012 We have newly renovated apartments that we would love to show you, just stop by the office for a tour! Fantastic living in CityFrontsubmitted by Barbara S. - Sep 05, 2011 |Recommended: YesCityfront has all the amenities that you can possibly want while living in one of the premier Chicago river/lakefront living. response from property - Feb 09, 2012 Come see us tonight to view the upgraded units from 6pm to 9pm. Just see the doorman! I love the area and clealiness of the building.submitted by James E. - Sep 03, 2011 |Recommended: YesCity Front is a beatiful city living residence with a spectacular view, situation in the heart of Chicago. It is centrally located to major highways, venues and shopping. It offers great amenities and is very affordable. Excellent Location, Friendly Staff, Sparse Ammenitiessubmitted by Michael H. - Sep 01, 2011 |Recommended: YesCityFront is a great place to live. It's in a prime location in the middle of the city, with excellent views of the city and the river or lake from almost any unit. The staff is friendly, and so far my experience has been great here. It's tucked just far enough into Streeterville that it's one of the more peaceful places I've been. My only complaints are the lack of a gym membership with the price of rent, and the necessity to use a keycard to enter the laundry room (my hands are usually full of laundry...). response from property - Feb 09, 2012 Come see the new upgrades tonight from 6pm to 9pm. Just see the doorman! It a great quiet place to live in such a large city.submitted by Carli R. - Aug 28, 2011 |Recommended: YesIt's great and I recommend living here. Good place to stay for professionals.submitted by Ram G. - Aug 09, 2011 |Recommended: YesVery convenient if your work place is nearby, clean living, not noisy, good people. response from property - Feb 09, 2012 We too believe that Cityfront offers a wonderful community for all of the professionals in downtown Chicago. 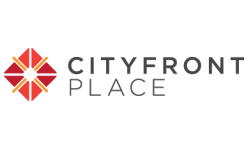 Thank you for calling Cityfront your home! Peaceful, friendly, roomy, relaxingsubmitted by Susan S. - Aug 05, 2011 |Recommended: YesThe staff is friendly, the location is more neighborhood than I believed possible in Streeterville, it's quiet in comparison to other places in River North and the amenities are great! response from property - Feb 09, 2012 Come see us tonight to view our upgraded units. 6pm to 8pm; just see the doorman! Great location, spacious rooms, optimal closet space, quiet, convenient, pretty submitted by Natasha G. - Aug 01, 2011 |Recommended: YesThe building is located in the perfect location as its proximity to EVERYTHING is very convenient. The doorstaff is very kind, friendly, and they take the time to help us feel safe. Rooms are very spacious and are well kept, with great appliances. Each room has great views. The hallway carpets are outdated as well as some of the paintings but this is very minor and does not hurt the appeal of the apartment. The downfall is that you have to split some of the utilities and in many cases you may have not used heat/ac but still have to pay. I would also like the option of using other cable services other than RCN. Also it is unusual that there is not a manual exhaust for the kitchen and the bathroom. Boxes that are left in the trash shute need to be collected more regularly as those that live near it can smell it through a closed door. The deck also has really nice views but smoking/glass enforcement needs to be in place. There is a very nice gym available/pool but unfortunately you have to pay additional. It would be nice to have cheaper gym rates. As advertised previously there is a party room for tenants to use free of charge as a party/lounge space , but it has been closed. We need to open this space again and have this available for a social atmosphere. Packages are left with the dry cleaners but sometimes they neglect to tell you there is something waiting. Parking is a major issue as it is very expensive to even have guests park in the building. There should be discounted parking available. Overall, the tenants themselves are very friendly and building is great for everyone. A suggestion would be to have extra maps and have the doorstaff have them available for guests. I really enjoy that the building is in a quieter area and its very clean and tidy. As a student its very convenient as its near all the grocery stores, retail shopping, public transportation and tourist sites. Great place to live for all ages. Building overall is well maintained and the maintenance staff is very professional and efficient. response from property - Feb 09, 2012 Come see us tonight to view the upgraded units. 6pm to 9pm, just see the doorman! Greatsubmitted by Veronica G. - Jul 21, 2011 |Recommended: YesYes! response from property - Feb 09, 2012 Come see us tonight to see our upgraded units. 6pm to 9pm, just see the doorman! Love it.submitted by William L. - Jul 05, 2011 |Recommended: YesGreat location, great staff, great apartment! response from property - Feb 09, 2012 Come join us tonight if you have time to view our new updated units. 6pm to 8pm, just see the doorman!